Social commerce solutions provider Easy Social Shop is trying to live up to the first word in its name with Wednesday’s announcement of a feature allowing merchants to create Facebook stores from pre-existing online stores with one click. 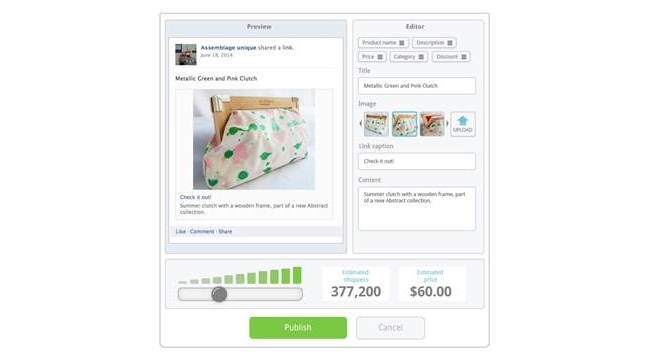 According to Easy Social Shop, the Facebook stores, aimed at small and midsized businesses, are fully integrated with existing ecommerce shops. The company added that it currently hosts more than 100,000 shops, which drive sales growth of 10 percent to 18 percent across its user base. The new feature gives online merchants an automated tool that will run effective and dynamic social media ad campaigns in with a single click. After a merchant inputs a few basic details, the campaign will automatically generate the creative and target relevant users, providing SMB owners with a time- and cost-efficient method for utilizing social media advertising. Stripping away the complexities of setting up advertising campaigns on Facebook, Easy Social Shop’s tool doesn’t require any knowledge of industry jargon or an extensive investment of time and effort to create ad campaigns, which SMB owners often can’t afford. Easy Social Shop’s vast data sets are used to identify the most relevant users, and utilize advanced algorithms to automatically adjust tactics as needed. The advertising maintenance and performance measurement are handled by the platform itself. Advertising on social media is a critical mechanism for SMBs to improve sales and drive growth, so it was only natural for us to address this need for our merchants. Easy Social Shop is committed to serving as a comprehensive platform that allows SMBs to utilize social media to its fullest benefit. Finally SMBs can advertise via a platform that speaks their language. We can help them grow and develop their businesses by reaching new audiences. We’re gradually rolling the new feature to our merchants, and from recent usage measurements, we saw that 89 percent advertised for their first time on Facebook via Easy Social Shop, and that 72 percent are promoting another product after their first attempt. SMB owners are forced to juggle a host of responsibilities, and this leaves them with little time to give social media campaigns the attention they need. Our new advertising solution allows online merchants to maximize social media marketing channels without needing any prior marketing experience.